I am still stuck on Christmas. 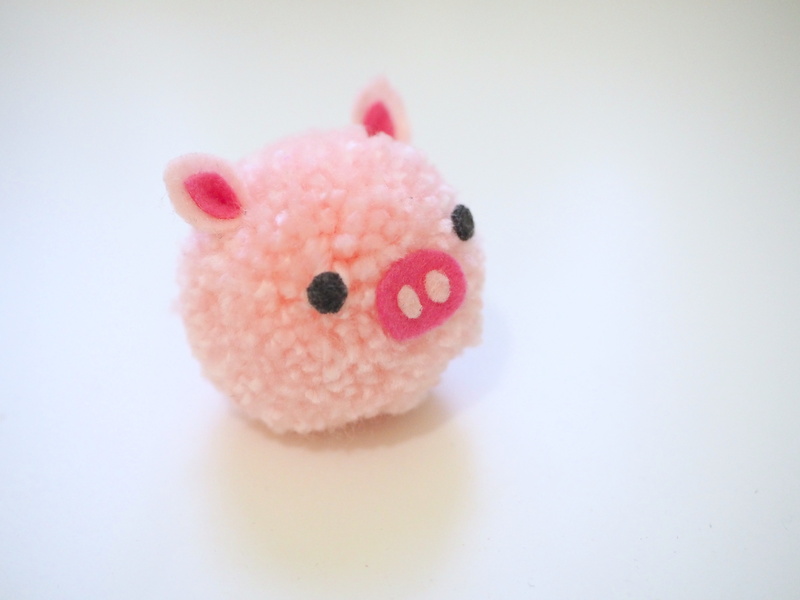 I have something cute to show you, but it was a gift, so maybe by Tuesday I can show it! 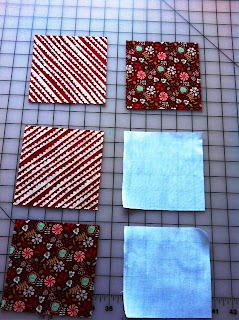 Now I am working on some self designed blocks to make myself a tree skirt. 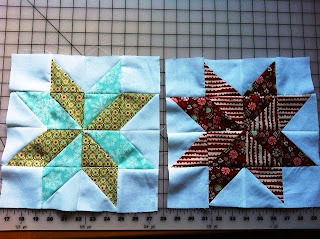 Here are a couple of finished blocks. 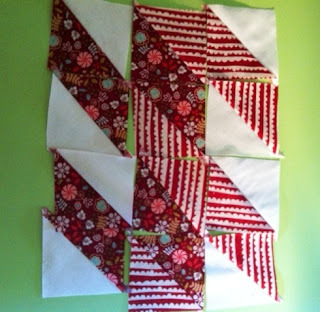 I am planning to sash it like the tree skirt pattern I have used in the past. 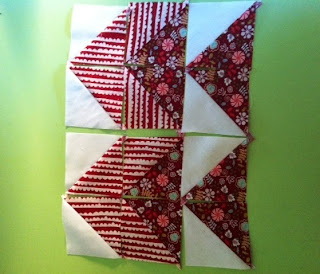 I love half square triangles, so I thought I would put together a little tutorial. 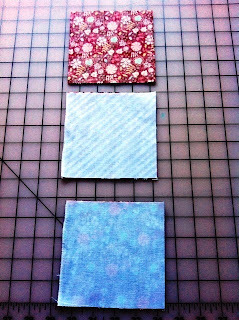 I used 5" squares, or charm pack sized pieces of Aspen Frost by Basic Grey and the same size of some white cotton I had. I lay them out just like I did above. 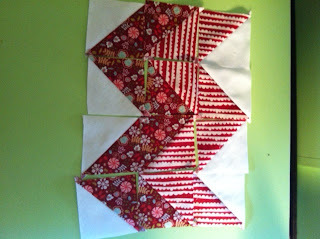 Then I place each of the three rows right sides together and pin in the middle to hold them together. 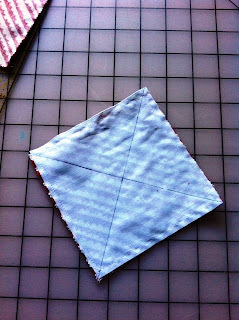 Then sew all the way around the square using a 1/4" seam. This step was weird to photograph, so I drew cutting lines. You will cut as marked above from corner to corner. 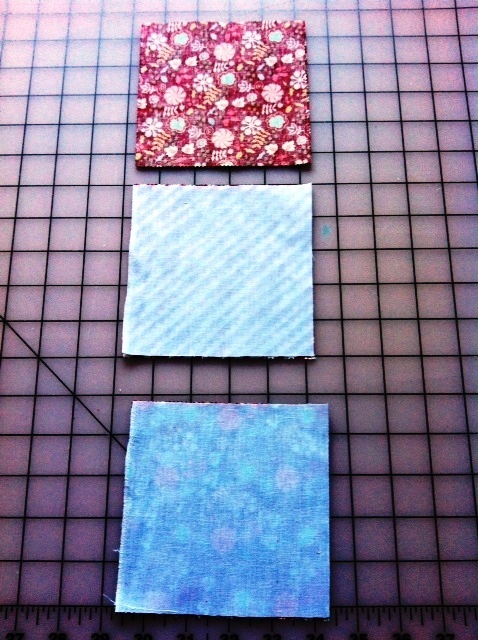 I usually starch and iron before this step, because you are cutting the squares on the bias. This helps stabilize the sides of you squares. 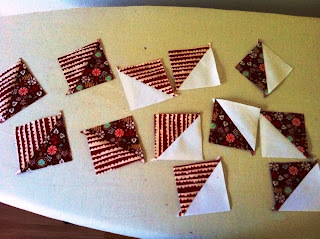 Press your triangles open, and now you have twelve little half square triangles! So easy! 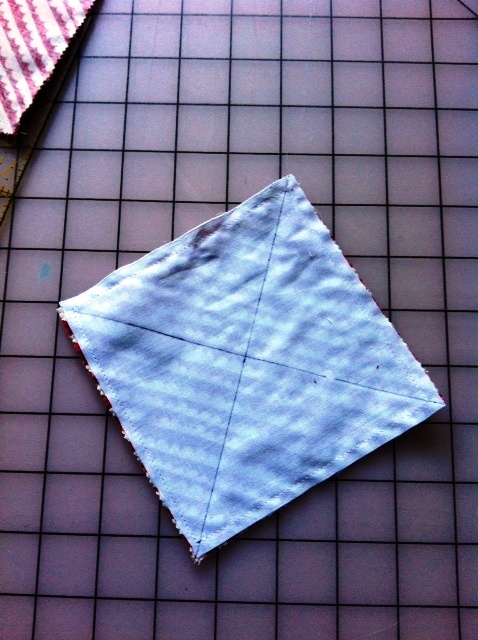 Cut off the excess pieces that overlap the edges of the two corners. 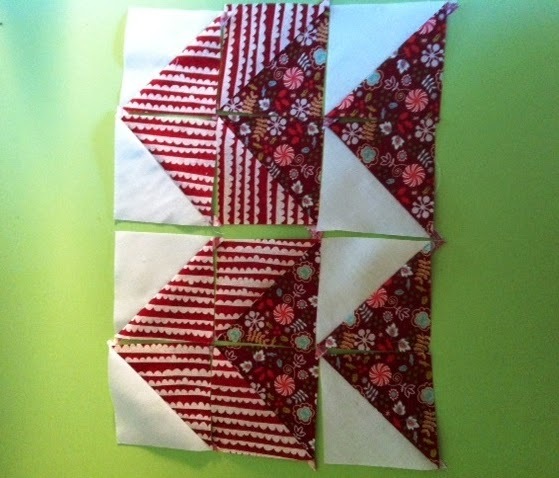 Next is the great part of half squares triangles. 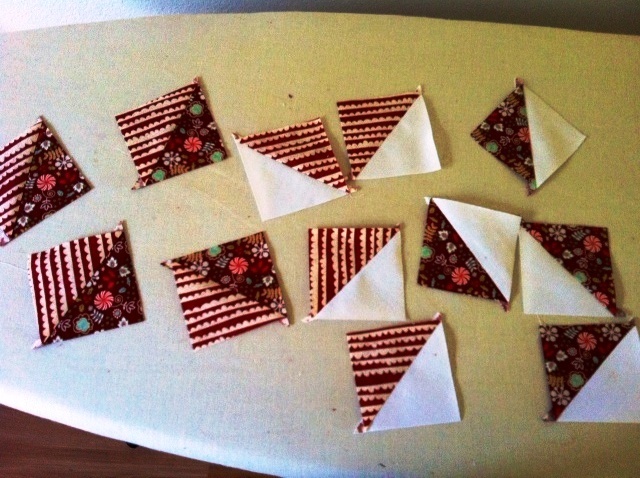 Lay them out however you like and make great designs. 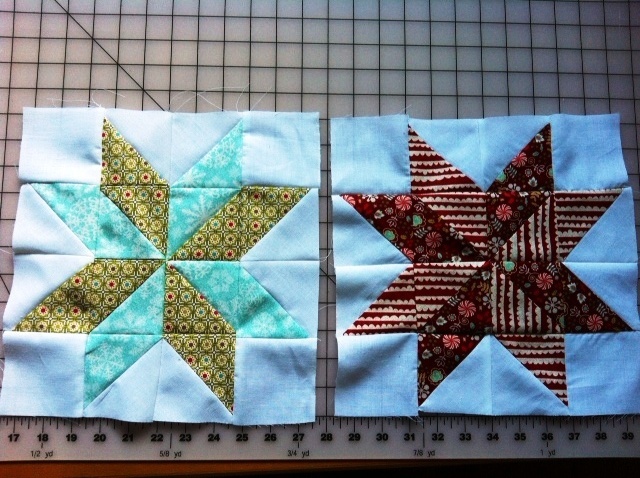 You can make a star like I did by adding a few white squares that are the same size as you pressed pieces. 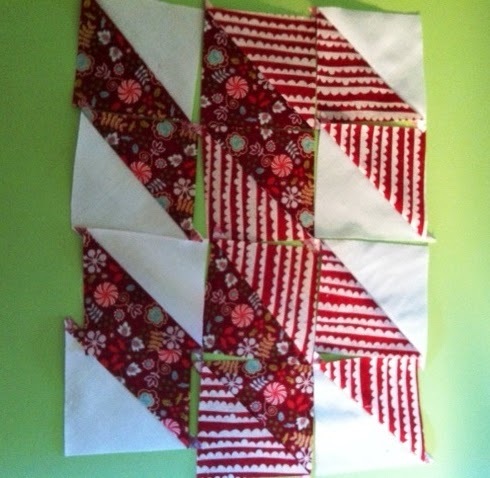 You can make ever popular chevrons. 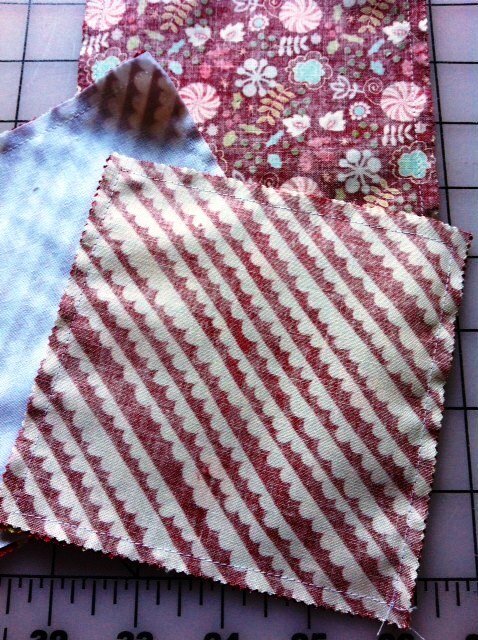 Or you can make cool designs with no rhyme or reason. The possibilities are endless. 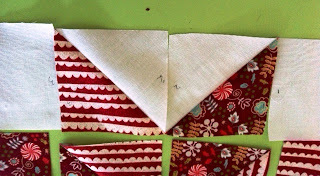 When I decide on my design I mark the pieces that go together with matching numbers which helps me keep what pieces go together straight. It is worth the extra minute! It is that easy! 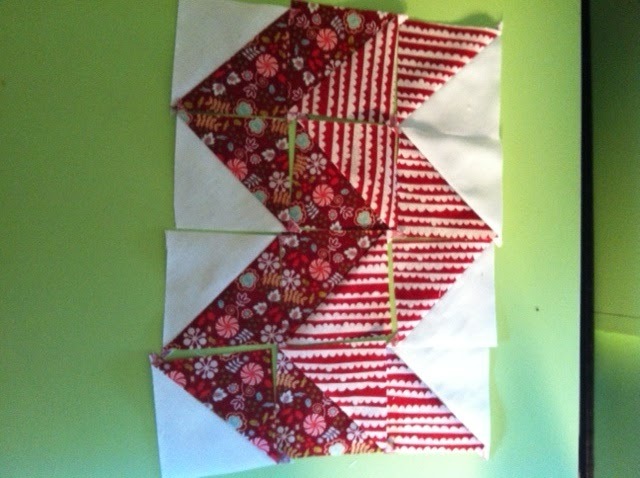 I have been making a block in about 30 minutes. 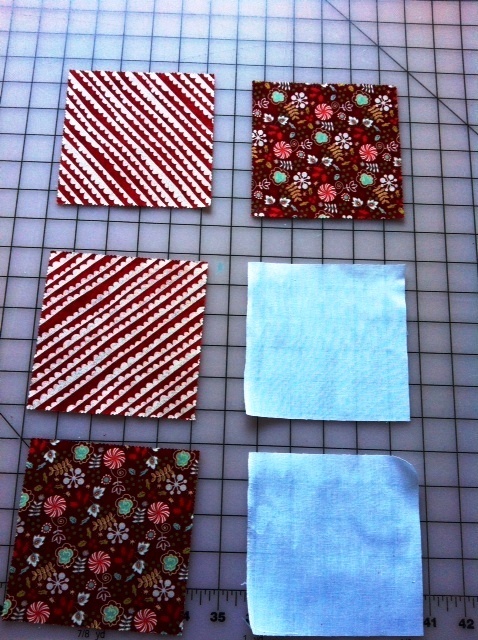 I am using two charm packs and white cotton. I hope to have a finished product done very soon. Can't wait to see the finished project! !